Blogging will be light. My dear mother-in-law passed away yesterday. An interesting life story... her mother died when Ida and her brother were toddlers. A few years later her father married a widow with a child, and they had a child together before her father disappeared mysteriously when all the children were still under the age of 10. Her (step)mother raised all the children by taking in other people's laundry and baking bread in the wee hours of the morning that the children would then sell door to door before school each day -- in the rain, the snow and the heat of the Heartland. Until she came to Arizona last year to convalesce, she lived her entire life within 20 miles of where she was born -- in a small farming community in Illinois. It is where we will return to lay her to rest. She hated getting old and her body failing her. She lived on her own in her own home until she was 87 years old and she hated losing her independence and having to rely on others. Hated it. But she loved... She loved the color lavender -- not purple or lilac -- but lavender. (Girls will get that.) She LOVED extra crispy bacon. And strawberry ice cream with real strawberries. Kentucky Fried Chicken. That old Irish wool sweater. She liked sitting in front of our fireplace. She loved reading the newspaper -- any newspaper... cover to cover, every page... with a cup of coffee (instant only) with real milk --none of that non-dairy creamer stuff. But more than anything she loved her family. I can't say anything that would adequately describe Ida Marie. You may judge a woman by her looks or her clothing or perhaps even her accumulated possessions or wealth. I would measure a woman's accomplishments by the legacy she leaves behind in her children... and their children. If the three wonderful, caring, intelligent and happy sons she raised and all the loving, happy and successful grandchildren with which she was blessed are how we measure Ida's life, then it was full and complete and an unmitigated success. 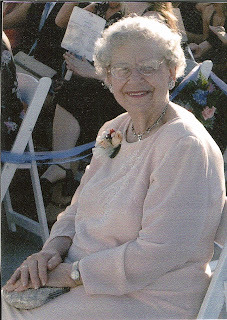 She leaves in mourning one sister, one sister-in-law, three devoted sons and their wives, eight grandchildren (and seven spouses) and one great grandson. Her husband of 55 years and her two brothers predeceased her. She is already greatly missed. Thoughts and prayers to DH, you and the rest of the family. Please let me know if there is anything I can do. You and your family have my sympathy. She is young and healthy once again. Age is nothing were she is now. May God rest her soul. I'm so sorry for your loss. You write about her wonderfully. Thank you for sharing just a little of her story. (((hugs))) I am so, so sorry for your loss. We are with you in prayer. Some Soldier's Mom you an your's will be in my prayers. So very sorry for your loss, but sounds like she was a very, very wonderful woman. Hugs. What a beautiful tribute. My prayers and sympathies are with your family. Hugs and prayers to you and your husband. You are both very dear to me and I know how much a part of your lives your mother-in-law was...I think she and my grandma (also in her late 80's) would have gotten along famously. We are thinking of you and the family. I proudly present you with the Thinking Blogger Award! I'm so sorry for your loss. Hugs and prayers for your family. I'm so sorry. The family is in my thoughts and prayers. What a great tribute. How fortunate you are to have had her as your MIL. Thank you for sharing her with us. Oh, she looks like a sweetie! What a fortunate woman you have been to have such a mother-in-law. Hopefully you can focus on all the happy memories --- and that SMILE! Comfort to you and yours. So sorry to hear about your loss. She sounds like a great person, who was well loved and will be sorely missed. That is the measure of a persons' life. Blessings and prayers to your family. This could very well be the nicest tribute I've ever read. May she rest in peace. I am deeply sorry for your loss and empathise with you. Losing a loved one is by far the hardest to deal with. My daughter was in Iraq when her paternal Grandmother passed last year. She was deeply saddened she could not be home then. She made her farewells after her return and visited with her Grandfather, who is still with us. May God bless you and your family at this time.